If you want to add more levels into your dungeon (and who wouldn’t? ), you can do it by right clicking on a level’s name in the Project window. From the same context menu, you will find options for deleting levels or changing the level’s properties. From the level’s properties you can change the name of the level, modify its position in the world and select the background music. Modifying the coordinates defines where the levels are in relation to another and you should always have only one level in one set of coordinates. Z is height, so if you stack the levels on top of each others, you only need to modify this value. Positive numbers go deeper and negative higher. X axis runs from negative west towards positive east and Y axis goes from negative north to positive south. You can use the keyboard shortcuts Page Up and Page Down to change the level in Z axis and Ctrl + arrow keys in the X and Y axes. With larger projects, where it takes a lot of time to start the preview mode, you may want to temporarily toggle off levels by clicking and ctrl+clicking on the orange markers next to the level coordinates in the Project window. This only affects the preview so you can export as usual even though you have inactive levels. To connect the levels to one and another, you can use stairs and pits for vertical movement and exits for horizontal. 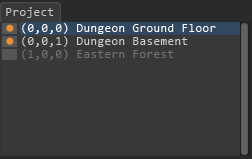 If you place a staircase that leads down (dungeon_stairs_down for instance), there needs to be a staircase entity in the same location (but with a reversed orientation) that leads up in the level below. With pits, you should take care that there is an empty square in the level below for the player to fall into. Exits, such as forest_exit must be laid on the very edge of the map and they will transport the player to the neighboring level’s edge. When the level is ready for other players to try out, all you need to do is to publish it to Steam Workshop (only available for users who have the game on Steam) or to export it. Exporting packages the dungeon (along with any custom assets you might have) into a single .dat file which you can hand over to your friends to play or you can upload it to 3rd party services such as Grimrock Nexus. Before sharing content you should familiarize yourself with the modding and asset usage terms. After you have some custom dungeons to play, all you need to do is start a new game and pick a custom dungeon for you to explore! The game will look for custom dungeon .dat files from the “\Documents\Almost Human\Legend of Grimrock\Dungeons” directory in Windows or you can subscribe to custom dungeons in Steam Workshop and they will be automatically downloaded to the correct location. Now you know all that it takes to create and share Legend of Grimrock custom dungeons! If you’re still feeling adventurous you could also take a look at how to script in the dungeon editor or how you can use custom assets, such as new graphics, sounds, items etc. in your dungeons. Have fun!